A lot of the online conversation surrounding last night’s Olympic opening—besides all the stuff about glistening Tongan men—was centered on the lackluster coverage by Matt Lauer, Meredith Vieira, and the rest of the coverage crew at NBC. Besides cramming commercials into every conceivable space, the NBC team’s commentating was mostly just drab and pointless, with no obvious passion for the actual games. Watching it, you’d be forgiven for wondering: Is there anybody talking about this competition that actually cares? Enter Leslie Jones. The Saturday Night Live and Ghostbusters star—blessedly returned from her self-imposed Twitter exile after packs of rampaging, racist dogs tried to hound her off the site—is ready to give the 2016 Summer Games the coverage they deserve, kicking off with a couple of videos highlighting just how excited she is for the Olympics to start. But lest you think Jones’ Twitter is only good for generalized Olympic hype, she also digs into the nitty-gritty of the actual events. Apparently, the international competition superfan tries to watch them all, and isn’t afraid to Vine her reactions to each and every one (especially if America happens to win the gold). 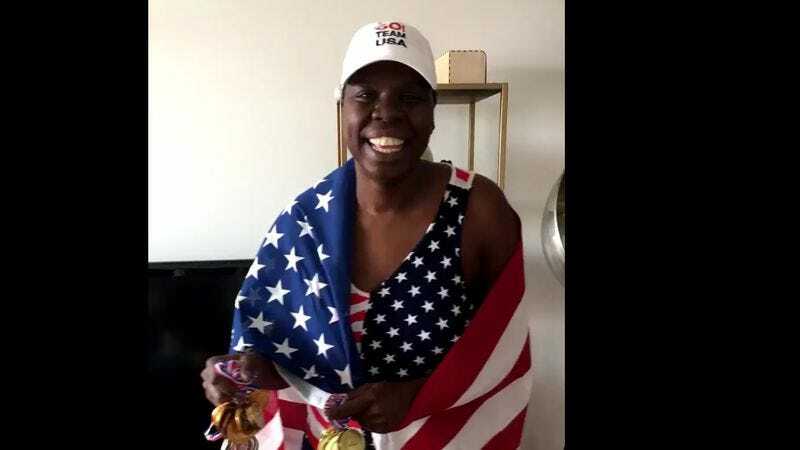 So, yeah, we’re not saying you should unplug your TV for the rest of the games, and just let Leslie Jones do all your Olympics commentating for you. But also, we are kind of saying that, because c’mon: U!S!A!, motherfuckers! U!S!A! Hopefully we’ll get to see her livening up some of the boring games shortly.